The narratives in Salt of the Earth bring up many (but certainly not all) issues facing Palestinians in general and Palestinian Christians in particular. These include the Christian Minority, Wall and Settlements, Freedom of Movement, Christian Zionism, Refugees, Education, and Security. Our links page also has a more comprehensive list of web-based resources and our what now page offers possible avenues for response. I feel blessed to be a Christian, especially in Palestine because Jesus lived, died, and rose here. Muslims respect our rights, and we respect theirs. Even so, sometimes I feel lonely when I'm the only Christian at school. -Sylvia from "The Way" And how is it that we hear, each of us, in our own native language? . . . Egypt and the parts of Libya belonging to Cyrene, and visitors from Rome, both Jews and proselytes, Cretans and Arabs – in our own languages we hear them speaking about God's deeds of power. Macedonia and Achaia have been pleased to share with the poor among the saints in Jerusalem. They were pleased to do this and indeed they owe it to them; for if the Gentiles have come to share in their spiritual blessings, they ought to be of service to them in material things. There have been Arab Christians since the day of Pentecost. Once the predominant faith in the Middle East, Christianity is now a minority religion. In the "Holy Land," no period has seen a more drastic decrease in the Christian population than the last fifty years, when the population has plummeted from 10-25% to less than 2%. This change is primarily due to emigration, most Christians leaving because of the difficult political and economic situation facing Palestinians in the Holy Land. While Christians face challenges as a minority in the society, they are not persecuted for their faith in either Israel or Palestine. The title of this project, Salt of the Earth, comes from the many conversations we have had not only with Palestinian Christians, but with Christians throughout the Middle East. For them, this phrase from the Sermon on the Mount is a phrase of strength to a minority community. We need only a little salt to flavor our food. A little transforms the whole; similarly, the Christian community, though small, has an impact felt throughout the Middle East. As their spiritual children in the West, it is our duty and obligation to support them in their witness and ministry in the land of Christ's birth. An officer came and said they'd make the Wall here. They took 40 to 50 dunums (10 to 12 acres) from us. They say "Good fences, good neighbors." But I say no. They took farm land from people. People can't come and go anymore. Where is the peace? There will never be peace this way. I ask one thing: speak to your decision-makers so they would view the issues here justly. -Sa'ed from "The Wall" My hand will be against the prophets who see false visions and utter lying divinations....Because, in truth, because they have misled my people, saying, "Peace," when there is no peace; and because, when the people build a wall, these prophets smear whitewash on it. Say to those who smear whitewash on it that it shall fall. An Occupying Power shall not transfer parts of its own civilian population into the territory it occupies. The Gaza Strip and the West Bank are occupied territories and the Israeli forces should withdraw from them. -UN Security Council Resolutions 242 and 338 Sa'ed describes his life in Jalame and his loss of land to the ongoing ISeparation Barrier project. Jalame is one of many Palestinian villages being directly affected by its construction. Built in the name of security, it goes far beyond the goal of separating two populations as it snakes deep into Palestinian Territory, confiscating land, uprooting trees, and cutting Palestinians off from access to education, jobs, water, and medical services. 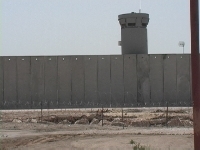 By the end of 2003, more than 300,000 people had been affected by the isolation of their communities throughout the northern West Bank, Jerusalem and Bethlehem, with concrete walls, fences, guard towers and military roads. The entire project may span 730 km, at a cost of $4mil/km or more. At the heart of its route is the location of settlements, which are illegal (according to international law and affirmed by the UN) Jewish-only colonies throughout the West Bank and Gaza Strip. In 1948, we left Haifa because of the war. We left all our furniture and gave our key to our Jewish neighbor, saying, "Keep the key. When we come back, we'll get it from you." Since that day we were never allowed to return. When we fled to Burqin from Haifa, and the Jewish armies followed us, we were afraid. Where did we go? To the churches. We were so afraid! We couldn't ask anyone's protection except God's. -Yvonne in "Exile" A voice is heard in Ramah, lamentation and bitter weeping. Rachel is weeping for her children; she refuses to be comforted for her children; because they are no more. Thus says the Lord: Keep your voice from weeping, and your eyes from tears; for there is a reward for your work, says the Lord: they shall some back from the land of the enemy; there is hope for your future says the Lord: your children shall come back to their own country. Palestinian refugees wishing to return to their homes and live at peace with their neighbors should be permitted to do so at the earliest practicable date, and compensation should be paid for the property of those choosing not to return and for loss of or damage to property. -UN Resolution 194, passed in 1948 and reaffirmed periodically since then. Israel's acceptance in the UN was conditional on its acceptance of this and other relevant resolutions. Everyone has the right to leave any country, including his own, and to return to his own country. -Universal Declaration of Human Rights Yvonne and her family were among the 750,000 Palestinians who were driven or fled from their homes during the war which established the state of Israel in 1948. They, their descendants, as well as refugees from the 1967 war, compose a refugee community of five million throughout the world. Dispossession, most acutely felt in that community, shapes modern Palestinian identity. Many feel that Israel, Arab States, the Palestinian Authority, and the international community have all failed to hear their voices and address their injustice. Solution of the "refugee problem" remains one of the major sticking points of Palestinian-Israeli peace negotiations. The soldiers made us wait from 4 AM to 2 PM, before telling us we couldn't pass. We had no food or water and were under the sun. Sometimes we have to wait as long as three hours in the school bus to pass the checkpoint. They take our IDs and search the bus. And then if they don't want to let us pass, they turn us back. In "The Way," Sylvia faces innumerable checkpoints and closures as she tries to get to university. In "The Garden," children and their teachers are held up and at times forbidden to make the trip to and from school. In "Exile," Yvonne is exasperated by the roadblocks as she tries to visit her grandparents' hometown; schoolboys Elia and Jeries and their family are trapped in their home by military curfews in "Life." Movement for Palestinians within the West Bank and Gaza Strip is severely limited by a matrix of checkpoints and road closures established primarily during the second intifada. More than 120 permanent checkpoints (as well as hundreds of destroyed roads, earthen mounds, trenches, cement blocks, and temporary "flying" checkpoints) riddle the Occupied Territories, separating the Palestinian population into 300 different islands of accessibility. The imposition of curfew (which prohibits anyone leaving his/her home and is enforced 24 hours a day) on major population centers for months at a time (with periodic lifting to allow people to buy food) has been decried as collective punishment by Israeli, Palestinian, and international human rights organizations. Travel closures and curfews have greatly impeded Palestinian education, health care, business, and agriculture. We hope the Western church remembers us in its prayers and we hope that we always remain brothers in Christ. I care for here you in the East, and you care for me in the West. But if you don't care for me as a person, then I'm finished. Christianity is buried. -Fr. To'mie from "A Mantle" "It isn’t for you to know times or seasons which the Father has set within his own authority." "But of that day or that hour no one knows, not even the angels in heaven, nor the Son, but only the Father." Perhaps there is no more important conversation for the Christian community today than that of Christian Zionism, the idea that the modern nation-state of Israel is the fulfillment of Biblical prophecy. Articulated by evangelical leaders such as Jerry Falwell, Pat Robertson, Hal Lindsay, John Hagee, and Ralph Reed, Christian Zionism is a dangerous theology and interpretation of Scripture. Christian Zionism claims to know how God's prophecy will be fulfilled, a proud and foolish claim for a community who claims Christ as fulfillment of Hebrew Bible prophecy concerning the Messiah. Peter thought he had understood God's prophecy, too - that's why he drew his sword in the Garden of Gethsemane. Christian Zionism also relegates the Church's status to irrelevance, the faithful Christian's only duty now to unconditionally support the State of Israel so that God's prophecies will come true. If we must make God's prophecies come true, we can prevent them from coming true, thus rendering Creation more powerful than the Creator, the ultimate in pride and folly. Christian Zionism also looks forward with glee to the final battle, which will end in another Jewish Holocaust, all of them slaughtered except for the faithful remnant of 144,000. The calling of the Christian is the calling to discipleship, to following Jesus Christ. Part of that calling is our solidarity with our brothers and sisters in Christ in the land of his birth. Education is one of our most important ministries as Christians. The closures have been a great hardship on our school. Even though our school busses should have permission to pass, often the children are held at checkpoints for hours on their way to school or on their way home, if they are allowed to pass at all. -Fr. Aktham in "The Garden" Happy are those who find wisdom and those who get understanding, for her income is better than silver and her revenue better than gold. Palestinians, both Christian and Muslim, have one of the highest levels of education in the Arab world. Christians have taken up education as one of their most important ministries, building schools and universities in Palestinian communities. The Christian school in Zababdeh is where Mughannam teaches "Advent," and Sawsan works in "The Garden." In Nablus, Elia and Jeries attend Christian school in "Life." Education has suffered greatly under the Occupation, and especially during both Intifadas. Curfews, checkpoints, and closures frequently violate the rights of children to get to school. Sylvia in "The Way" beats incredible odds to get to school. Sawsan and her children make the daily, uncertain journey from Jenin to Zababdeh to get to school in "The Garden." Out of the 86 people who died in the April 2002 incursions in Nablus, 70% were civilians. On the second day of the incursion, the wall of our church compound was demolished by the army. Nobody could believe this could be done to a church. It was very frightening when the soldiers entered shooting. They were all around us, and we had no electricity, no lights, no news on TV, no phones, and no water. -Reem from "Life" God is our refuge and our strength, a very present help in trouble. Therefore we will not fear, though the earth should change, though the mountains shake in the heart of the sea; though its waters roar and foam, though the mountains tremble with its tumult. The nations are in an uproar, the kingdoms totter; he utters his voice, the earth melts. The Lord of hosts is with us; the God of Jacob is our refuge. Everyone has the right to life, liberty, and security of person. An occupying power must protect the civilian population it occupies.